The stack of five notebooks is on the desk by my bed. Some of the notebooks have scuffs on the covers, some have pages sticking out awkwardly, and one has the dark remnants of a spilled soda on the bottom that causes the pages to flare out in a wavy pattern that resembles dried rose petals. All of them are filled with the scribbling and scrambling of my life over the past seven months. To someone else this stack of notebooks would simply look like trash ready to be taken out, but I look at them and see them for the life preservers they are. When, one week after both my sons had left home, the emotional tsunami of unexpected divorce crashed into my life, I was dragged under into the turmoil of waters I had never entered before. The suffocating emotions threatened to drown me. I did what I have always done in my life when faced with confusion or an excess of emotions. I grabbed on to a notebook, took the inky blackness that surrounded me and madly funneled it through the tip of a pen. I wrote, I wrote, and then I wrote some more. It was not neat writing. It was not cohesive. It was not organized. It was most certainly not polite. Sometimes it was not even comprehensible, but I wrote anyway. Anyone who loves writing can tell you about the power of putting words on paper during times of distress. It’s not just the freedom of expressing inner chaos on paper that gives relief. It’s also just the mere physical act of writing, the placing of the pen on the paper, the movement of the hand. It’s watching the letters and the emotion come out—reflected by the jagged cliffs of M’s and K’s, the loops created by words with double o’s, the low dip of a lower case y. The sprawling out of that ink, the unconscious but oh-so-revealing decision to stay on the lines or to forget the lines even exist is so very important. Each time I frantically wrote in my notebook, I felt relief when I felt the life preserver beneath my hand, grounding me, slowly lifting me up to the surface so I could breathe again. I never went anywhere without my notebook during those months. I needed it. It was my lifeline. It was the way I made it through my days. 1) Get out of bed. 3) Walk to kitchen and make lunch. It worked. Sometimes the only reason I did these things was because of the list in my notebook. While it was years of experience, my need for routine, and my true love of teaching and my students that allowed me to make it to every class, it was my notebook that got me through every class period. Little did my students know that while they were in groups working on their sentence-level skills, finding comma splices, fixing fragments, and creating complex-compound sentences, I was at that lectern writing sentences to stay level, desperately splicing together my thoughts and gathering up enough fragments to try to appear complete. Little by little, I began to need my notebook less and less. One day just last month I left it in my office for a night and I realized I would be OK without it. Yesterday, I finished the last page of a notebook and I went to the store to get another one. The past five had dark covers. This time, I symbolically choose a bright orange cover. The frantic, disjointed writing of the past has been replaced by more cohesive, flowing entries. I rarely need the survival notes I used to scrawl, but knowing I have a place to write them if I need to is still a comfort to me. I look at the stack of tattered, worn notebooks and I am in awe of them. 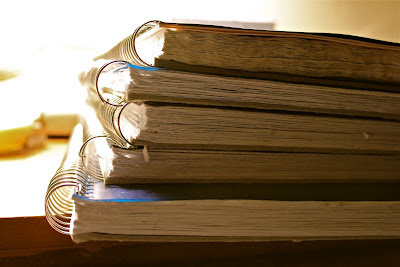 Even though there is heavy pain, a ton of sorrow, and the leaden weight of mourning on those pages, those notebooks still helped me to keep afloat. They helped to buoy me up on those difficult days. Perhaps woven in with the fibers, pressed into the pulp, infused into the cellulose of those pages, is always the stronger-than-sorrow buoyant promise of renewal and growth. As I work my way back into life, I am starting to understand that same promise is pressed and woven into the fibers of our souls as well. The grace and possibility of the blank page, the fresh start, is within each of us whenever we want to grasp on to it. We may not think it is there, that we don't have it within us, but it is and it is just waiting to be discovered, to be released, to help us to rise as high as we want to go. BB..you are a survivor!! I think you are on the other side of turmoil where the sun is shining, the grass is, indeed, greener and the air is fresh, crisp and full of life. Your notebooks full of words could be of help to others...write that book that is hiding deep inside of your heart. Betty, I so understand how writing things down can help you get through tough times. It is the same way for me. Having the outlet provides a release of those emotions that might otherwise take over and overwhelm me. I'm happy for you that you had those notebooks as a life preserver. Those who don't write aren't so lucky, and I wonder how they manage to get through tough times without that release valve. I love the title you chose for this piece, by the way. Happy Easter to you and yours! What an incredible journey you are on, Betty. I like this part--the part where you pass the rough seas and you find the warm sunshine. Yes.This is wonderful, Betty. You've put in words the need to put things in words. Good for you for finding a way and following it. Just beautiful. I love that your most recent notebook has a happy, bright color. All that pain and fear poured into those dark notebooks served a valuable purpose. You got it out and they contain it now. You are free to move on and grow. I love that you bought a bright orange cover for your next collection of words. Like the warmth of the sun, you are glowing. Your words are glowing. I can't tell you how much you mean to me, Betty. Without even "knowing" you, you touch my soul with your honesty. Very nice, I journal a lot and often wonder what others would think of my writing. Dang girl... if your notebooks are half as well written as this post, there's a Pulitzer sitting there on your nightstand. Reading about the way you used those notebooks gives me even more respect for you. I can only hope that I would be as resilient as you in similar circumstances. Is that the actual picture of the used notebooks? I can so relate to what you say here. There were times I had trouble even breathing. I sat at my computer and typed and typed. Just feelings never mind grammar or punctuation. Just get it out. Every day I did this especially in the worst of it. I don't any longer. I am too busy with life. Amazing. I totally get the therapeutic value of journaling! I have a huge stack that has gotten me through this empty nest stage that, even though I knew it was coming and prepared for it, hit me between the eyes with a few bricks. It has helped me with some struggles in my personal life as well. I'm so glad you wrotewrotewrote! Wow, I hear ya on the writing and journaling. I was reading a book by Ann Voskamp where she mentions that pens and penicils have eyes--and when you write what's on your heart it sheds light and puts it into focus. Betty, those journals are treasures. Those journals are the seeds from which the book you will write will spring forth. I have always believed you should write a book about your experience. You could help so many others who are going through similar experiences. I am amazed that you have filled five journals. I have filled nearly three since the death of my daughter. I, like you, would just write and write and write after her death. Writing was my lifeline. Writing helped my process the unreal event of my life. Writing allowed me to express emotions that would have destroyed me if I had kept them inside. I know you experienced the same catharsis. You have such insight. Thank you for reminding me of the blank page. I need to start writing again. I've been a bit frozen lately and have not been able to write. I know it is how I will move on to the next step in healing. Yay for Orange. It's a great color. You have come so far in such a short time. You must take pride in your accomplishments. There was a time I had to make lists to do the same things. But happily, I'm now where I want to be, where I need to be. And so are you. So Yay! I think you are your own GPS and you know where you need to head! They helped you to heal. 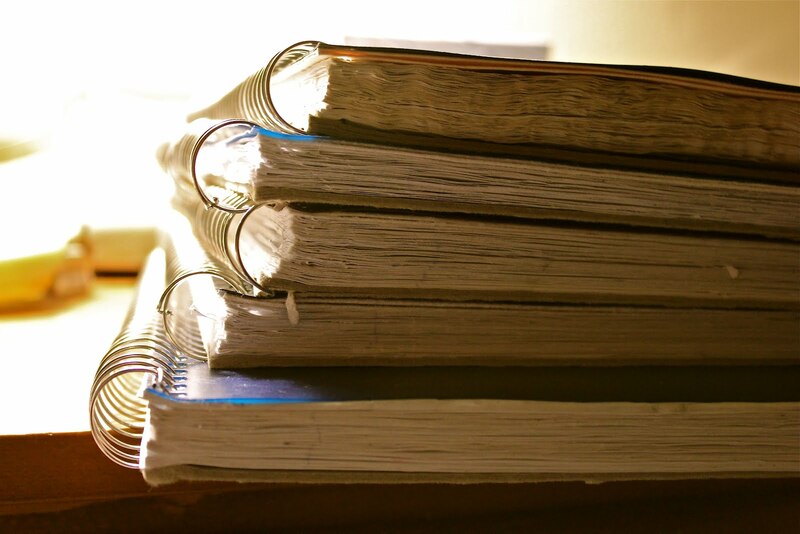 When we feel out of control, we want to DO something, and those notebooks gave you a way to DO. Glad your next one is brighter! Amazing! This is a powerful story. It has crossed my mind more than once that you have processed your pain more quickly than I would have expected. And this explains how you did that. I'm glad to hear you are feeling hopeful and renewed. I wish more people in distress knew that bit of wisdom. Writing it down can work for so many as it did for you. I think that is just terrific that you wrote all those feelings down. It is such a help to write things down. To me, it is so helpful to get things written down. At least it helps me too. And you can look at now, and see how far you have come out of the darkness. Good on you. I hope with all my heart that you look forward to each new page and what you have the ability to transform it to! You've come SO far. Blessings! Such an inspirational post. I find writing things down is reduces stress. It gives me a sense of peace. Speaking of writing, you are REALLY good at it! Those notebooks are amazing tools of survival. I know from experience. I also have a pile of letters, written, but never sent. That is also a great and healing tool. I think you've gotten over the hump my friend. Lot's of work and not a lot of fun doing so. Say, weren't you going to send me somthing? I had a stack of notebooks that had gotten me through the worst years of my life. Through childhood. Through adolescence. Through my divorce. And other heartbreaks. Through many, many difficult years. I kept through many, many moves. Not sure why I kept them. Felt like there should be a record of my suffering. Thought I might use them as source material for a book one day. But on my last move, I gathered them all up and threw them in the trash. I let them go. You smoothed out the dangling participle in life's complex-compound sentence and got on with it. Betty, your inner fortitude truly inspires. Hugs! Betty, bless you! You just put into words (and so beautifully) what I have always felt! There is no relief until you write it down somewhere. My favorite line: I " took the inky blackness that surrounded me and madly funneled it through the tip of a pen." I completely relate to the physical act of writing that stuff down bringing sanity and ultimately healing. I have been there, in my own small way. I will also add, Betty, that there is something more inside of you than this post indicates. It IS the writing, in part, but it is NOT JUST the writing. My mother-in-law committed suicide, and it covered reams of paper/notebooks with her journaling. Her journals were distressing to read after she took her life. Ultimately, she found no healing. I couldn't be happier for you, or more proud of you. Such a great piece of writing! It's amazing how much power a pen and paper can hold. I'm glad you found something to help get you thorough, something that you can look back on if you're ever struggling. Good for you, Betty!! What a beautiful and honest post. I can't imagine what you've been through, and sharing your trials surely helps others. Pen to paper is so therapeutic. I am amazed that you didn't take days, if not WEEKS, off from work. You are amazing all around. Betty, I'm so sorry to hear about the divorce on top of children leaving home. I'm glad you found a lifeline. This has been quite a year for you, so you needed one. There's nothing like writing, is there? Writing is an incredible outlet. I also have spiral notebooks filled with ramblings when I was in crisis. Those worn, coffee stained pages are your healing. So glad you turned to writing. Hi Betty, I'm new here, came via Empty Nester. Congratulations on surviving the last 6 months, I've only read a little bit but it sounds tough going. I think notebooks rock! I've used them during tough times in my life, and they're great for all the reasons you state here. Btw, I'm a teacher too, so could really identify with how difficult it must have been, and lol at you writing in the notebook and the students knowing nothing of what it was about!